The Carnival of Divided Government includes volunteers and draftees from both the blogosphere and main stream media. Despite our narrow focus (Federal Government divided between the major parties), the impending election is driving a dramatic increase in the quantity of on-topic posts, submissions and articles. To accomodate the accelerating momentum of the meme, we break the selections into categories, and will increase the frequency of Carnival posts between now and Nov 7th. We'll start weekly, but may move to two per week. First submissions are from and about the Investor Class, who are positively giddy about the prospects of a divided government result in the mid-terms. "... this is why the stock market seems immune to the threat of a Democrat victory in November. To the surprise of many, as Republican prospects have declined, stocks have rallied to historic highs. The market, which has always liked divided government (divided government means gridlock, which is good for the economy), just isn’t that afraid that Democrats will be able to do any real damage to the economy over the next two years. Maybe Bush will even get out that veto pen and do some real good." "As the November elections approach, the Democrats appear to have a good shot at winning one of the Houses of Congress - or at least shaving the Republican majority so thin that activist government would be practically impossible. To see if the conventional wisdom about divided government is true, three analysts recently did a statistical study of the economy and the investment markets over the past 56 years (Financial Analysts Journal, September/October 2006, by Scott Beyer, Gerald Jensen and Robert Johnson). Previous research has shown that unified governments really are more active, and that they spend more, run larger deficits and potentially allow more inflation..."
"Analysts think Democrats may win one or both houses of Congress in November. Here are some investment strategies to cash in on a divided government. If the November elections bring a politically divided government as expected, that would help bonds and some types of blue chips." Net net - buy big cap blue chip techs. "You learn all sorts of things in an election year, and lately I...Until recently, I was prepared to argue that divided government would be a good thing...The United States did well in the 1990s with a Democratic president and Republican Congress, and it survived the early 1970s with a Republican president and a Democratic Congress. Further, if Democrats got control of either the House or Senate, they would control committees that might then hold hearings that would expose some of the horrors of the Bush regime while derailing some of its more odious proposed legislation." "Maybe someday a candidate with Republican domestic policies and Democratic foreign policies will miraculously catch fire with voters. For now, the best hope is for a return to divided government and gridlock. Of course, if that happens, voters will be complaining to pollsters about how little gets done in Washington." He says that like it's a bad thing. "...Bush's raid on the treasury has deprived government of needed resources. Addressing these pocketbook frustrations will require the White House as well as Congress. And it will require a rollback of Bush's tax cuts for the wealthy, not just to balance the budget but to restore social spending. In the meantime, the risk is that voters will see divided government as mere partisan squabbling rather than a principled contest for what kind of country America is to be...This little story is just a precursor that there's unease out there in the Democrat ranks about the future and this election, and they're setting the table for if they lose." "Amidst all the debate that my "Libertarian Democrat" piece spawned, there's one particular misconception that I feel needs to be dealt with upfront — the notion that this is all a ploy to convince libertarians to vote Democratic. That, of course, was fueled by the title of the Cato Unbound package, "Should Libertarians Vote Democrat?" It was a title that I hadn't seen until my piece was up and posted. 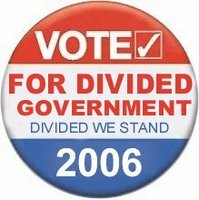 If I had written an essay on why libertarians should vote Democratic, it would've been a short essay: divided government, 'nuff said." "In this election I do plan to vote Democratic, and I encourage others to do likewise. But it’s not from enthusiasm. 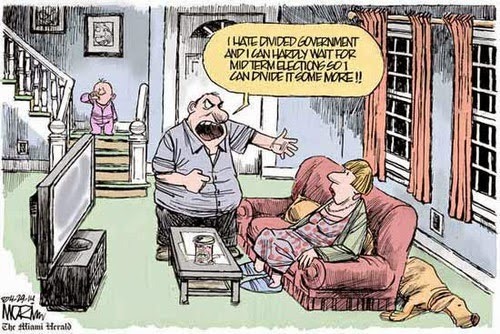 It’s because divided government is an achievable local maximum: A government divided between socially conservative budget busters and socially liberal nanny-staters is far from where I want to be, but it’s the best one can reasonably expect from a single upcoming election." "The halcyon days of the 1990s and the resulting budget surpluses were indeed to a large extent the work of the balancing act between the Clinton and Gingrich camps (built on the Reagan foundation of the 1980s). Voters have an intuitive understanding about balance and curbing excess, and it is that broader instinct that will likely create a shift back to a divided government." "I'm thinking of testing a new voting heuristic based on Daryl Levinson & Richard Pildes, Separation of Parties, Not Powers, which builds on earlier work suggesting that the political parties have essentially obliterated the traditional notion of separation of branches. We do not have political branches that compete for power, as Madison envisioned, due to party loyalty. Thus, Congress' response to Hamdan v. Rumsfeld, 126 S. Ct. 2749 (2006), was to pass the Military Commission Act of 2006, which gave the President about 90% (estimate) of what he was asking for. This occurred because, Levinson & Pildes would suggest, Congress was controlled by the same party as the President. Thus, my new voting heuristic to be tested is to vote for divided government, not because it leads to gridlock, which is good; but because it functionally replicates the original separation of powers with branches checking one another." In a addition to an original rationale for divided government, Tung has introduced me to some new reading material and fodder for a future post. Stay tuned. "The real reason most voters want to see the Democrats take over Congress in this next election is to once again have divided government in Washington DC. Neither major party does a good job when there is not participation present from folks that don’t agree with the party in power. Over history there are countless examples of how the Democrats have lost their way when there was not a strong Republican Party to keep them in check and I believe what we are all witnessing right now in DC is a result of too much power in the hands of too few people who mainly all think alike. The beauty of the United States is its diversity of views and opinions. When one small group manages to take over complete control of the government, corruption and narrow minded thinking will not be that far behind." 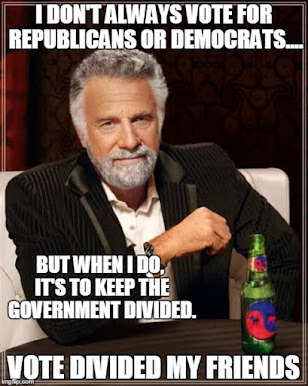 I like to include at least one post that argues against divided government (they are getting harder to find), in order to provide needed guidance and help to the confused blogger. This carnival, Betsy is the beneficiary of my guidance. No need to thank me Betsy. Betsy asks a lot questions including "How did David Broder get this naive?" at Betsy's Page. I am only too happy to help her with some answers [embedded in her quote -mw]. "But here is where Broder, despite his decades of experience, lapses into a naive optimism that divided government is superior...Does anyone really believe that there will be some substantive change in the political environment if the Democrats controlled Congress?" [Yes. Almost everyone does. You may want try doing a little reading. Niskanen and Ornstein are a good place to start. -mw] "Will partisan bickering end?" [No. It is not supposed to. The idea is for Congress to be more than a rubber stamp. - mw ] "Come on! Hasn't Broder read about how the Democrats are panting to start all sorts of investigations into the Bush administration?" [Ummm - Providing oversight of the Executive Branch and the government in general is the constitiutional responsibility of the "The Peoples House" - That is exactly what Congress is supposed to do. That is the way our government is designed to work. - mw] "Does he think that such investigations will lead to a nonpartisan environment? Does he really think that Nancy Pelosi and Bush will then join hands to work together in a magnificent non-partisan kumbaya moment?" [No, but Congress will begin to once again fullfill the responsibilities that was envisioned under the Constitution to provide Checks and Balance in the government. And that is a very good thing. - mw]"
Avant News presenting President Clinton Jails 938,000 Illegal Enemy Combatants posted at Avant News. And it is truly great. Just go read it. That concludes this edition. Thanks for stopping by, and thanks to all for the submissions. The next edition of the Carnival of Divided Government will be posted one week from today, at 11:59 PM PST Monday October 23. Submit your blog article at carnival of divided government using our carnival submission form. Past posts and future hosts can be found on our blog carnival index page.